Tired of waking up achy and wondering how to choose the best mattress so you can finally upgrade Mr. Lumpy. If you’re not thinking about it, perhaps you should be! When was the last time you bought a new mattress? If you can’t remember, then you are overdue! Generally speaking you want to purchase a new one every 10-15 years. With a zillion choices out there, though, how do you choose the best mattress? Our tips are a good place to start! Check them out! Firm or soft is an important decision in terms of waking up achy in the morning and keeping your body in proper alignment. If the mattress is too firm, the main pressure points of your body will become sore. These include the curvature of your spine, heels, shoulders, head and buttocks. You want your body to be supported in a neutral position where all those main pressure points are in proper alignment. A mattress that is too soft will allow your body to flop out of alignment. The end result is the same: waking up sore. When you are testing out a new mattress, you want to simulate how your will be sleeping at home the best you can. Bring your own pillow. Take a nap! Well maybe not really, but do spend about 10-15 minutes testing out each mattress. You can’t really pick something you will sleep on every night by lying down for a few minutes at a time. Take your time! Here are some different kinds of mattresses on the market to help you choose the best mattress for you! Affiliate links included to help you choose the best mattress. Innerspring: Most common mattress still used today. They have updated over the years and each coil is now individually enclosed. No more poking you in the middle of the night! Some sales people may talk to you about coil count, but really anything over 390 is such a minute difference you won’t feel it. You do want to make sure you get at least a 390 spring count so you avoid waking up with a sore back. 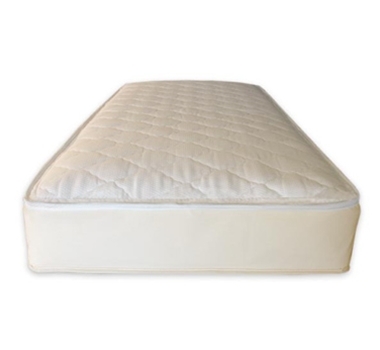 We love the Naturepedic Organic Cotton 2-in-1 Ultra/Quilted Mattresses because it’s eco-friendly and comfy! Latex: Made of rubber, they are very firm and bouncy yet supportive. Different from memory foam, the latex mattress pushes back, resulting in better support. They only come in firm, so if soft is what you are looking for, bypass the latex. Memory Foam: What used to sound like a mattress only a king could afford, they are becoming more and more popular. The material forms to your body so support is optimal for sleeping. If you are not alone in your bed, this is also a good choice as memory foam absorbs movement, so you will not be disturbed by your partner (or four legged friend) moving. As great as this all sounds, take into consideration that memory foam is also temperature sensitive, so some complaints have been of feeling hot at night. Air: You are probably thinking you will need to blow this up every night, something you would pull out for an overnight guest. Oh so wrong! This is similar in make up as the innerspring, however instead of coils, the chambers are filled with air. These are great for couples who have different preferences in firmness, as these can be adjusted. The downside to this choice, is creating the firmness is up to you, so some people often complain of waking up with back pain. Play with the settings and find what is best for you! Choosing the best mattress can be fun yet daunting. Ultimately the right mattress will make you feel like you are sleeping on a cloud. Whether it be firm, soft, air or memory foam, everyone has different needs. What have you done while mattress shopping? Do you have any tips on how to choose the best mattress? Post them in the comments! This is a great post indeed. I seriously believe you need the perfect mattress to wake up refreshed in the mornings. The standard mattress is the one I have now with the inner springs. I would love to have the memory foam mattress. Thanks for sharing. We’ve never had a new mattress like any of the above ever. The only time we ever had a new mattress at all was a $25 waterbed mattress back in the 80s. OUr mattress is only a couple of years old and I really like it but it is a difficult thing – you can only lie on them for a few minutes in the store and then you hope for the best. I just bought a mattress about 6 months ago & am pretty happy with it. My best tip would be take your time & think about how you REALLY sleep.